With the Spring audio season upon us, most mobile retailers get excited about this time of year. Spring brings new products and customers are out enjoying the outdoors and cruising/car show season begins. What’s not to love, here at the office we have even started barbecuing for lunch! It is a great time to refocus and get ready for the hustle of audio season. This time of year, most shop owners start to consider new areas of revenue. In the past two years, many manufacturers have been throwing their hats into the ring to fight for a piece of the Marine Industry’s audio business. Rockford Fosgate, MB Quart, Memphis and many others have dedicated divisions to the category they call Motorsports. Many manufacturers are putting all their research and development money exclusively into this category, should you? “Geography, that is a no-brainer, I have three lakes within 100 km (70 miles).” I am not referring solely to lakes in your area, I am referring to oceans, rivers, and lakes in the geographic area. How are these vessels (boats) different? Ocean going vessels, usually use white colored equipment, must be seawater resistant, may or may not have a wakeboard/speaker tower and the radio must have a nautical weather channel to be legal. River vessels, 9/10 do not have wakeboard/speaker towers and have a very open all-aluminum hull. Lake vessels, usually have wakeboard towers and use silver, black or white products. Do you have marinas or boat mooring options nearby, for example, ask yourself how many marinas within 100 km (70 miles)? Ask yourself “how many customers do I want, how many builds etc.”? Is your goal to do ten boats or fifty? If there are three marinas in your area, and there are one hundred boats at each facility including drydock options (boats not stored on the water). Rough math would be three hundred boats, if your goal was 10% of the boats, your perfect season would be thirty boats/customers. The term customer could be a simple speaker swap or larger water shaking system. Why do I choose marinas as measuring stick? Marinas are the perfect way to determine what boats are physically out there. This is a huge consideration, but it does not have to hold you back! Some storefronts are blessed to have a thirty-foot-long installation bay with twelve-foot ceilings and have shop doors at both ends. But not many, ask yourself these questions, “Can I fit a sixteen-foot boat with three to five feet of clearance all the way around the boat?” “Can I maneuver a boat safely in and out of the installation bay?”, this would include security poles, vehicles etc.? If the answer is “no” to any of these questions, there are still options. Remember I was mentioning marinas? Go to the marina, set up a truck with orange cones around it and place a sandwich board stating, “ABC Audio in onsite and available for any questions with your contact info”. Then place another sandwich board on the wharf next to the boat you are working on. The marina is a great place to talk to people, this shows them that “Bob” the boat owner trusts you etc. and why shouldn’t Dave? This allows you to have an opportunity to talk to marina staff and make you visible to the other boat owners (free advertising and it’s face to face time)! You did not need to dedicate any additional space for additional expansion in this category. But…you will have to dedicate addition tools, shop supplies and some product for this type of installation service. Having an on-site vehicle is an expense, but at least you can move all the assets inside your storefront in the offseason. You need to have marine specific products, with features that mean something to marine customers. Let’s talk boat tower speakers, these speakers are going to get wet, either by a power washer or the elements. It’s just the way it is, in this type of installation. A typical coax speaker has a tweeter mounted on a pole coming through the dust cap of a speaker. Water can simply get in through the gap between the midrange and tweeter and destroy the internals of the speaker. Some manufacturers use an “accordion style” boot to seal the space between the midrange and tweeter to keep out the water, but this is a moving part. The midrange will move in/out and the rubber will break down over time. This is still a decent solution for keeping water out of the speaker. Other manufacturers use a sealed midrange, this means there is no hole in the dust cap. 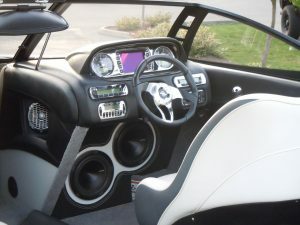 The tweeter portion of the speaker is mounted on the grill. This style of mounting makes it 100% watertight with no moving parts. This is a better system, but this level of performance costs more. These are two examples of features that boat owners can relate to. Why? Boat owner’s power wash the inside boats, speakers are going to get wet with use and the boat will be at the mercy of the elements when in the water. You also must know boat terminology, if a customer asks you what speakers fit on a Centurion Action “X” tower, you must know the answer. Ask the customer what kind of boat he has BEFORE going to quote it! Guys, google is your friend here, search Centurion Action “X” tower, so you can get a plan for selling the system. A few manufacturers make products with direct bolt-in replacements for an action “X” tower, do know which ones? Is Marine Audio the holy grail? Only time will tell. Does it offer a new revenue stream for your business, absolutely! With a small investment of an “outside installation team”, a couple of sandwich boards, and taking the time to research some quality brands you can be up and running quickly. But be strategic, look for opportunities to enter the marine audio market, marinas offer a captive audience, a measurable demographic and a new profitable business category for your store. If you know someone that would enjoy this article, please share!